Eric Liddell was an athlete who competed for Great Britain in the Olympic Games in Paris in 1924. The award winning film ‘Chariots of Fire’ tells the story of Liddell and another British athlete Harold Abrahams. They both won Gold Medals at the games. Chariots of Fire was nominated for seven Academy Awards in 1982 and won four. Eric Liddell was born in Tientsin, China on January 16th 1902. His parents were Scottish who were working as missionaries in China. Liddell was an outstanding athlete who was educated at the University of Edinburgh. He competed successfully in sprint races and played on the wing for the Scotland national rugby union team in the 1922 and 1923 Five Nations Championships. In the 1924 Olympic Games Liddell was listed to compete in the 100m. A heat for the race was to be held on Sunday. Because of his Christian convictions Liddell would not compete on the Sabbath. Liddell later competed in the 400m race and won gold. In 1925 Liddell returned to China to work as a missionary. 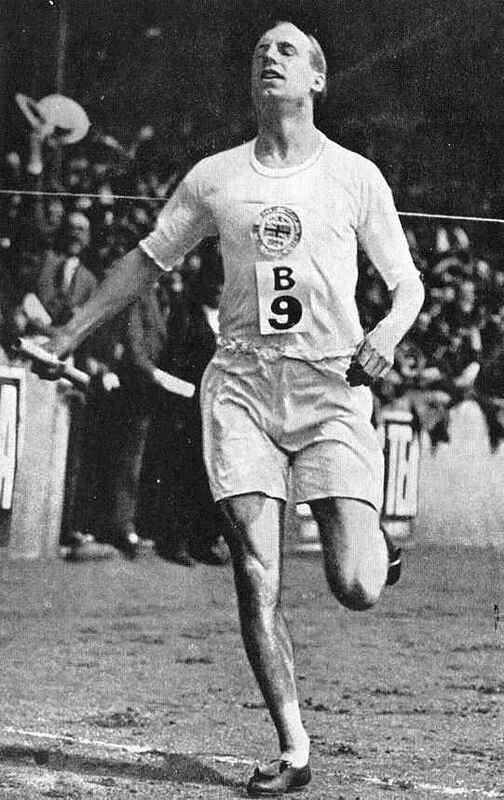 Eric Liddell, Olympic Gold Medal winner, rugby player, and missionary whose story was told in the film Chariots of Fire died aged 43 in an internment camp in China in the year 1945 On This Day. 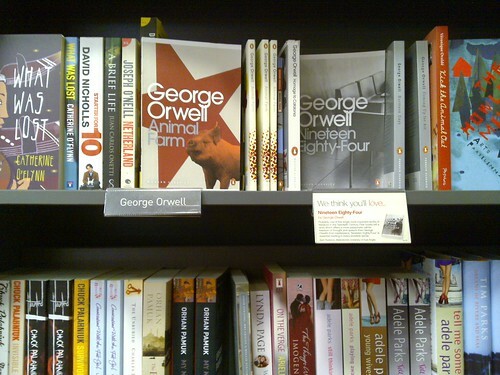 Animal Farm is an award winning novella written by George Orwell. It is regarded as the most famous political allegory of the 20th century. It describes how a group of farm animals revolt against the tyranny of their human master. The animals are then subjected a far greater tyranny by their own kind. 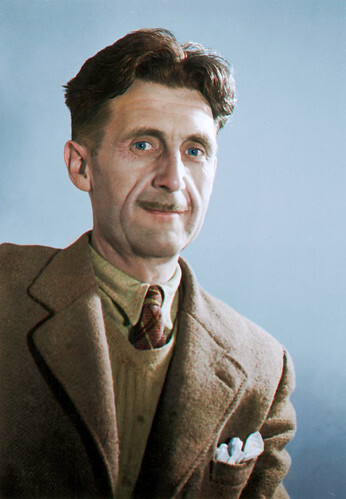 In Animal Farm, Orwell reflects the rise to power of the Soviet dictator Joseph Stalin. The Communist Party seized power from Tsar Nicolas II following the Russian Revolution of 1917. The dictatorship of the Tsar was eventually replaced by the even more brutal dictatorship of Stalin. Animal Farm by George Orwell was first published in the year 1945 On This Day. Aung San Suu Kyi is State Counsellor (de facto Prime Minister) of Myanmar. She is the leader of the National League for Democracy which won a landslide victory in the Myanmar General Election of 2015. She has served in the role of State Counsellor since April 6th 2016. 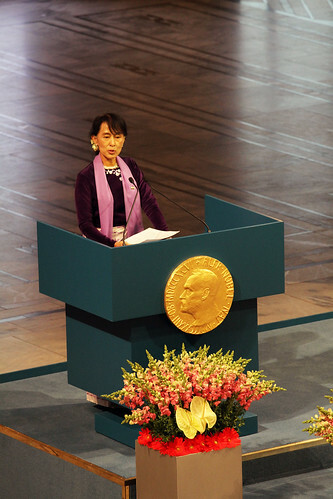 Aung San Suu Kyi was awarded the Nobel Peace Prize in 1991. She was under house arrest at the time. Aung San Suu Kyi was born in Rangoon, Burma in 1945. Rangoon is now Yangon. Her father, Aung San, who brought about Burma’s independence from British rule, is regarded as the Father of the Nation of Myanmar. He was assassinated during the transition period, six months before independence. At the time Aung San Suu Kyi was two years old. Suu Kyi’s mother was appointed ambassador to Delhi in 1960. Suu Kyi was educated there and later studied at Oxford University in England. She graduated from Oxford in 1967 and lived and worked in the United States, Japan and Bhutan before settling in the England. In 1988 she returned to Burma to care for her mother who was critically ill. When Suu Kyi returned to her homeland there was major political upheaval in the country. Myanmar had been ruled by a military junta since 1962. She was one of the founders of the National League for Democracy. The aim was to establish a democracy and bring about the integration of the various ethnic groups. She led a programme of non-violent opposition to the military junta. Suu Kyi was placed under house arrest in 1989. Her party won the 1990 election but the military refused to allow parliament to convene. She spent most of the following 21 years under house arrest. 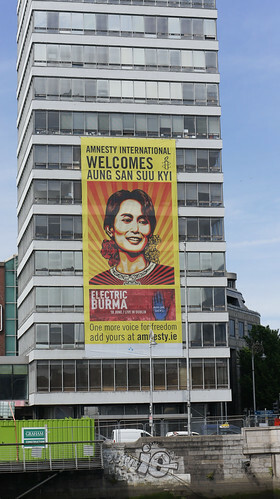 Suu Kyi was finally released in November 2010. Since then Myanmar has undergone a rapid programme of democratisation, culminating in the election of Suu Kyi as State Counsellor in 2016. However since her election she has failed to bring about the integration of the various ethnic groups in Burma. There has been international criticism of her failure to stop the persecution of the Rohingya people in the west of Myanmar and the Kachin people in the east. Aung San Suu Kyi, State Counsellor of Myanmar, was born in the year 1945 On This Day. During the Battle of Berlin on April 30th 1945 Adolf Hitler, the NAZI (National Socialist German Workers’ Party) leader, committed suicide. His successor authorised Germany’s surrender a week later. 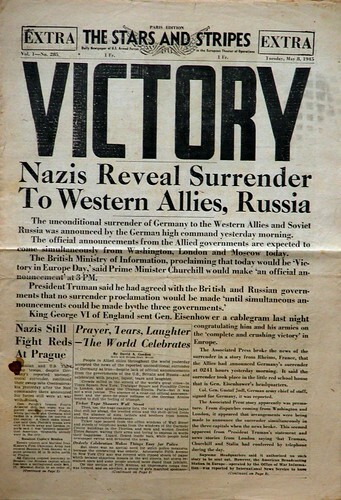 The surrender brought to an end to World War II in Europe. The German surrender was signed at the Headquarters of General Eisenhower in Reims in France on May 7th 1945. The following day was declared a public holiday. Celebrations were held to mark Victory in Europe Day in Great Britain, the United States Cities and in formerly occupied cities in Western Europe. Victory in Europe Day was a public holiday held to mark the end of World War II in Europe in the year 1945 On This Day. Van Morrison is a singer songwriter and musician who is a native of Belfast, Northern Ireland. Known as ‘Van the Man’ his musical genres include rock, rhythm and blues, folk, celtic, country and gospel. He is the recipient of several awards and received an OBE in 1996 for his services to music. 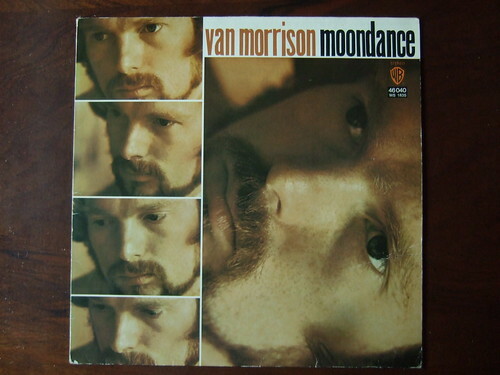 Van Morrison was born George Ivan Morrison in Belfast in 1945. He was educated at Orangefield School in east Belfast where people such as Gerald Dawe Poet & Professor in English at TCD, David Ervine Politician and leader of the Progressive Unionist Party and Brian Keenan writer and former Beirut captive, were also educated. Interested in music from a young age, Morrison performed with several bands as a youth. During the showband era in Ireland Morrison performed with bands such as the ‘Monarchs’ and ‘Them’. In 1967 he began his solo career with the hit single ‘Brown Eyed Girl’. A string of hits followed including, ‘Jackie Wilson Said’, ‘Domino’, ‘Wild Night’ and ‘Days Like This’. He has received two Grammy Awards and in 1993 was inducted into the Rock and Roll Hall of Fame. He has also been conferred with honorary doctorates by the University of Ulster and Queen’s University Belfast. Van Morrison, singer, songwriter and musician was born in Belfast in the year 1945 On This Day.